Image: Just part of one load of the records being transferred to the WFA's storage facility. Three HGVs were eventually required to complete the transfer. 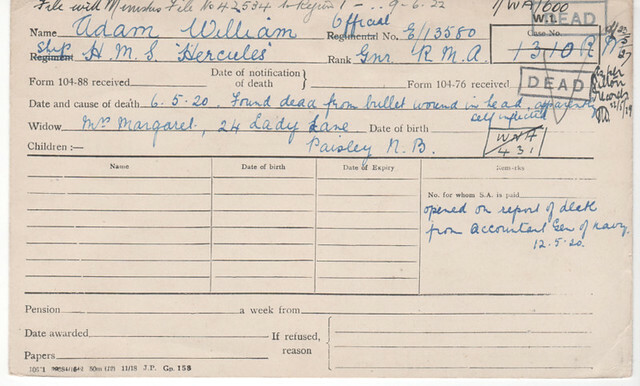 One of the numerous types of record that comprises the WFA's Pension Record Card and Ledger Archive is a 'run' of about one million cards representing soldiers, sailors and airmen who were killed or died in the Great War, whose dependents claimed a pension. This set (which seem to have been called the "Dependents Cards" by the Ministry of Pensions) is contained in over 1,000 drawers. In order to highlight the type of information that is available from these cards, just one of these drawers has been examined and some of the more interesting, remarkable or 'different' cards have been extracted and examined. 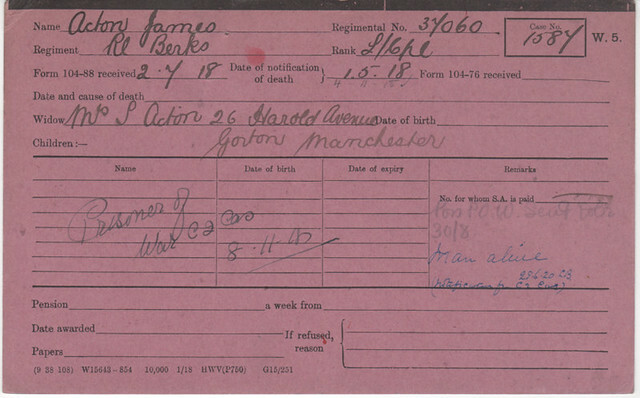 The first example is the card for L/Cpl James Acton, number 37060 of the Royal Berkshire Regiment. 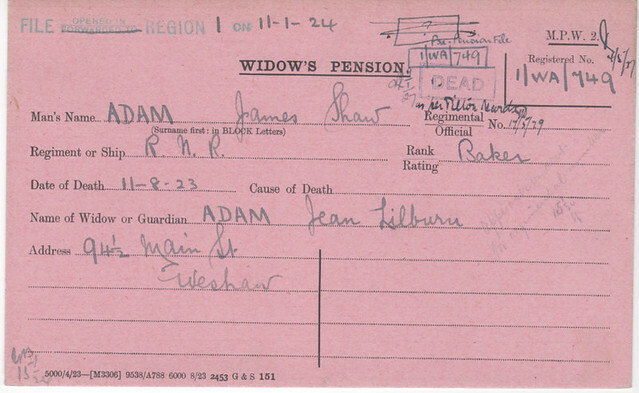 This is an example of the unusual scenario of a pension being claimed for a soldier who later turned out not to have been killed (hence the "man alive" note on the right hand side of the card) but who had, in fact, been captured by the enemy. According to the Medal Index Cards (which were also saved by the WFA). Acton was previously 4626 of the Cheshire Regiment. Because he survived the war there is no entry for him on the Commonwealth War Graves Commission's database, nor is there any existing record in the "Burnt Series" of soldiers service records. 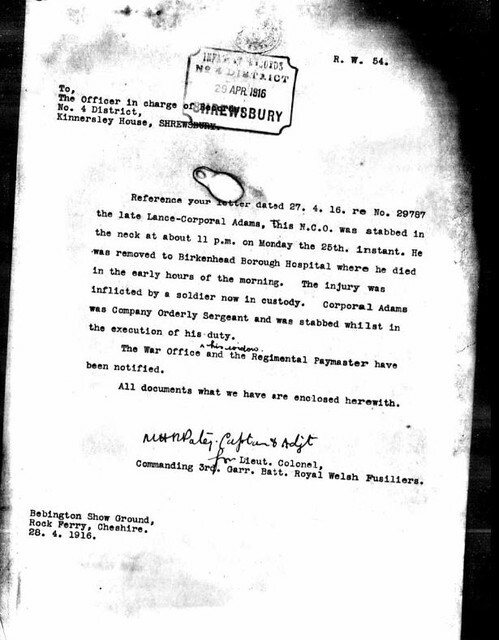 The form 104-88 referred to on the card is "Death notification of a married man sent from the Territorial Force Record Office to the War Office". It seems these cards were pre- printed with this form number notwithstanding not all notifications would be from the TF Record Office. It would appear that all these notifications (whether on form 104-88 or otherwise) are recorded on the cards. Even more forms are known to exist, such as Form B 104-93 "Death notification of Single Man sent from T.F. Record Office to the W.O and if Will exists for Effects purposes". The actual process adopted here is one that would benefit from much further study in due course. The card also refers to Form 104-76: this is the declaration made by the Widow of a Soldier in support of claim to pension for herself and children. Although, in this case, this has been left blank. The next example is that of the 'Dependents' card for Private Stephen Acton. The clerk responsible for completing this has failed to detail the cause and date of death. It is possible that this was because this was initially unknown (we have "now presumed dead" on the top of the card which indicates that there was a gap between him being recorded as missing and the official presumption of his death). 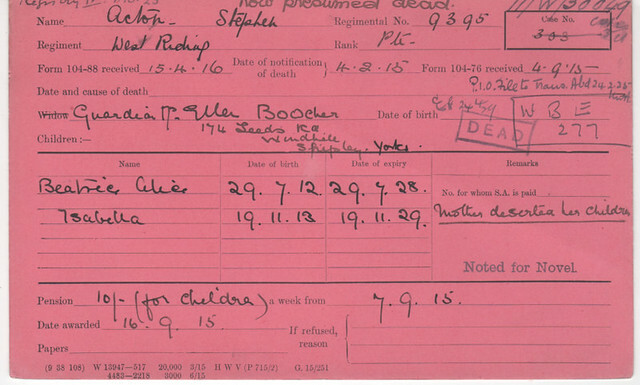 According to the Commonwealth War Graves Commission, Stephen Acton was killed on 8 November 1914; the card indicates that notification did not come through until 4 February 1915, with form 104-88 only arriving with the War Office in 1916. The card has been stamped "Noted for Novel" - this is a frequent occurrence but the meaning of this is currently unknown. Anyone reading this article who may be able to shed some light on this is invited to contact the author. The particularly poignant detail on this card, however, is "mother deserted her children". This must explain why the children's guardian, Ellen Boocher of Shipley, was the recipient of the 10/- (50 pence or £0.50) Pension. No service record of Stephen Acton seems to survive in the Burnt Series. He is commemorated on the Ypres (Menin Gate) Memorial. Private James (Jas on the card) Adair of the Royal Irish Rifles was a casualty of the fateful 1 July 1916 attack on the Somme. There is no service record for him in the Burnt Series. Although the Commonwealth War Graves Commission's database confirms his wife's name it gives no indication of the fact that he had ten children - hence the pension of 37/- (£1.85) per week paid from 22 January 1917. Amongst the numerous notations on the card is one that says "N/N". It is possible this is the "Noted for Novel" mentioned above. According to research undertaken, it seems that the basic widow's pension of 13s 9d (68 pence, £0.68) was increased to 5s (25 pence, £0.25) for the first child, plus 4s 2d (21 pence, £0.21) for the second child, plus 3s 4d (17 pence, £0.17) for the third child and 2s 6d (12 pence, £0.12) for the fourth and subsequent children. On this basis it seems Mrs Adair should have received a pension of 43s 9d (£2.18). Why it was 37s (£1.85) requires further investigation. James Adair is commemorated on the Thiepval Memorial to the Missing. The next example is not a soldier, but a sailor, James Shaw Adam. Interestingly, this is one of the latest dates that we have so far seen for a death that has resulted in a pension claim, being 11 August 1923 (this is nearly two years after the CWGC's 'cut off date' for First World War commemorations). Although such late deaths will be a tiny proportion of the cards, this could well prove to be a very valuable resource for genealogists. Another sailor whose card has been examined was William Adam (a gunner in the Royal Marine Artillery) who died on 6 May 1920 whilst serving on HMS Hercules. The cause of William Adam's death is stated as "found dead from bullet wound in the head, apparently self inflicted". Hercules had a reputation as 'a pugilists ship' amongst the men. Many a 'troublemaker' was posted to Hercules. Discipline was strict. She was equipped with a boxing ring. Breaches of discipline, especially those that resulted in arguments or fights, would very often be dealt with by 'volunteering' those involved to fight in the ring. Large wagers were often placed on these bouts by both the officers and men. Another punishment meted out was to lock miscreants in the brig with a length of used heavy hawser. The offender was allowed out as soon as he had, with his bare hands, unpicked the hawser. This might take days and result in ripped and bleeding nails. Whilst we cannot assume this harsh environment was directly attributable to his suicide, there certainly is room for conjecture here. The next example is that of Clarence John Adams, a Lance Corporal in the Royal Welsh Fusiliers. The first thing to note with this example is that Adams is an alias - his real surname is James. There has been a higher proportion of these "alias" cards noticed than expected. Once the cards are digitised, we hope to have a much clearer picture of the number of aliases; again, this would provide a useful research project in due course. 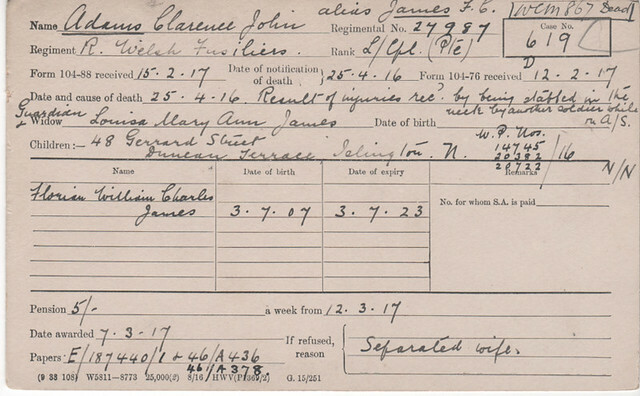 The card is remarkable in that it details the fact Clarence Adams seems to have been murdered on 25 April 1916. What caused this incident may be worth some local research (he is buried at Bebington Cemetery, south of Birkenhead on the Wirral peninsula). 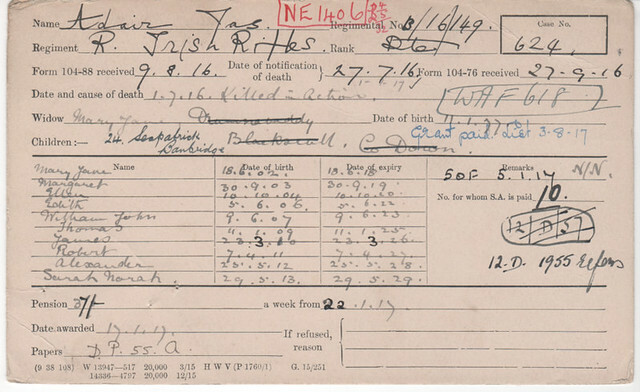 As can be seen, the card is explicit as to his cause of death "Result of injuries rec[eived] by being stabbed in the neck by another soldier whilst on A/S [Active Service]". With no widow on hand (the card says "separated wife"), the only son of L/Cpl Adams (Florian William Charles) was awarded a 5/- (25 pence, £0.25) per week pension, which seems to have been paid to the boy's guardian, Louisa James of Islington. The service record on this occasion survives, and surprisingly suggests that there were a further two children. It also explains a little about his marital status and also confirms that he was stabbed whilst acting as Company Orderly Sergeant "whilst in the execution of his duty". As with all family research, controversy is always possible. This is certainly the case with this card for Edwin Adams. It would appear that Edwin's wife seems to have married him bigamously. Sapper Adams is buried in Cabaret-Rouge British Cemetery, Souchez. No service record can be found amongst the burnt series, so any further research into the background to this 'marriage' would have to be undertaken via non-military sources. 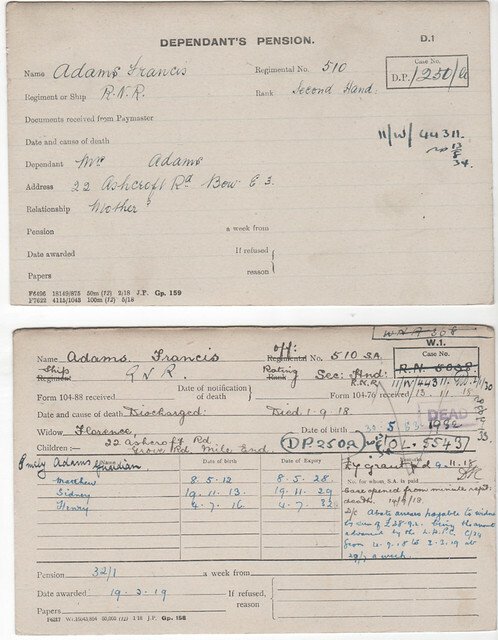 The difference between the cards which show an 'alias' (see Clarence Adams - above) and this example for Ernest Edward Adams which gives an 'official' name is not known. Why William Henry Adams enlisted as 'Ernest Edward' Adams may never be known. His Medal Index Card gives no suggestion of his real name, and no trace of his service record can be found amongst the Burnt Series. 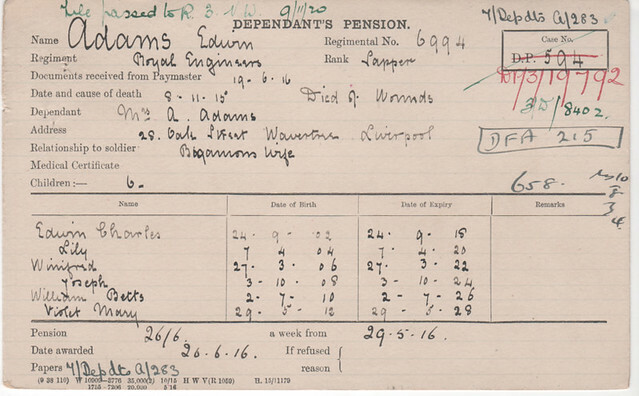 The CWGC entry confirms 'Ernest Edward' Adams, so at this stage the only records that show he enlisted under this assumed name are the WFA's Pension Record Cards. This card would be a vital clue for anyone trying to research William Henry Adams. 'Ernest Edward' Adams is commemorated on the Arras Memorial to the Missing. Finally there is the unusual example of two cards for one individual. Sometimes this occurs when there was two (or more) competing claims for a pension. Other instances of this are when a number of brothers were killed - in these cases the name of each sibling is cross-referenced on each card. However, the case of Francis Adams fits neither of these scenarios. The fact there are two cards may have been a clerical error, but does show the differing amounts of detail that are provided on these cards. Francis Adams seems to have been discharged from the Royal Navy Reserve prior to his death, which may explain why he is not commemorated by the CWGC. 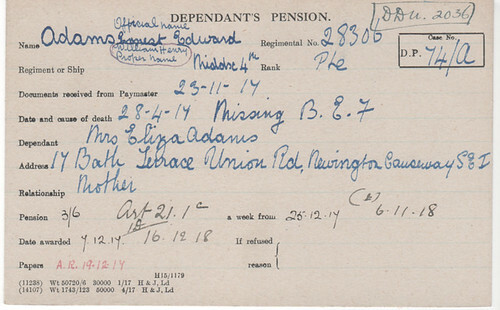 The WFA's Pension Record Cards are a massive and valuable archive that require many years of study in order to extract all possible information. Anyone wishing to make a study of the archive as part of a degree level dissertation or thesis is invited to contact the author.